Many Avtech instruments are supplied with, or can be used with, AV-LZ low-impedance transmission line. For the examples below we have assumed that the AV-LZ1 line, which has a 1 Ohm characteristic impedance (Z0), is being used. To obtain the very best waveform, it is important that the characteristic impedance of the transmission line used to connect the load to the pulser be well matched to the load impedance. This will minimize transmission line reflections. Thus, when connecting to a low-impedance load, like a laser diode, the AV-LZ1 line will probably provide the best performance. 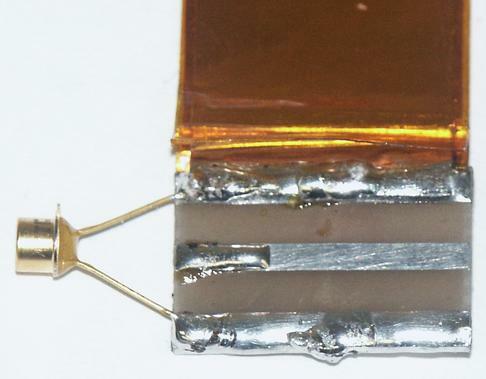 Top View – The diode anode is soldered to the OUT pad. 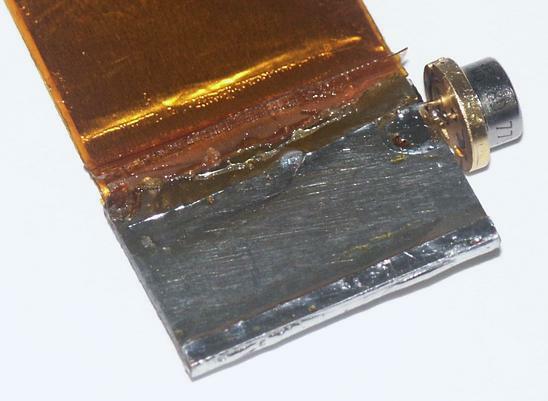 Bottom View – The diode cathode is soldered to the ground plane. The arrangement shown above will produce best results if the resistance of the diode is approximately equal to the characteristic impedance of the transmission line. If the diode resistance is lower, then a series resistor should be installed. This is illustrated in the next section. Wrong Way To Connect a Diode. The leads are too long! In the above photo, approximately 1 inch of lead length is present in the circuit. The inductance of such leads is approximately 10 nH / inch. This may add significant distortion to the waveform, which can be estimated using Lenz's Law (V = L dI/dt). 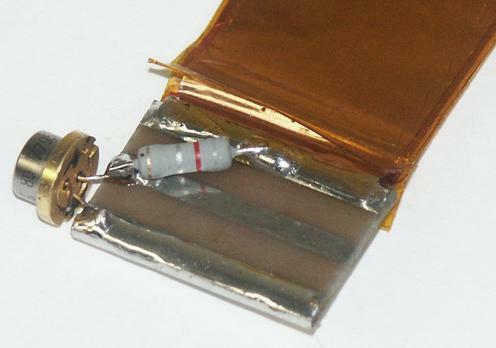 In this set-up, one end of the resistor has been soldered to the OUT pad. The other end is soldered to the anode of the diode. 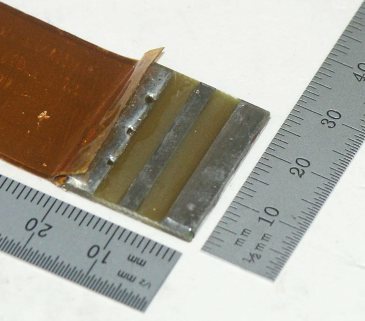 The diode cathode is soldered to ground. See the “SUGGESTED RESISTORS" section for more about appropriate resistors. The photo below shows a resistive load installed between the top-side OUT and GND pads. Also, two methods of measuring the current are shown. On the right side of the photo, an oscilloscope probe (and ground clip) are connected across the resistor. The current waveform can be calculated from the observed voltage waveform using Ohm's Law. However, the parasitic inductance of the resistor can distort the waveform slightly. 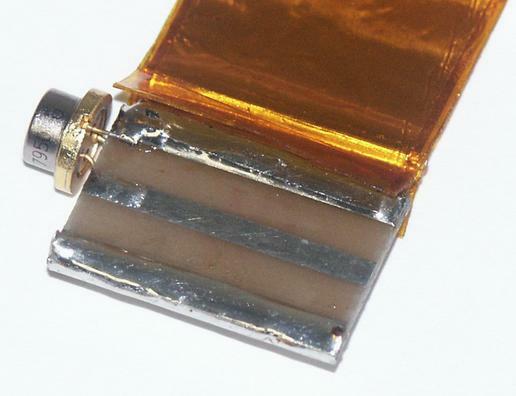 For some applications, a current probe may yield better measurements. On the left side of the photo, an Integrated Sensor Technologies (http://www.isensortech.com/) model 711 current probe is shown. 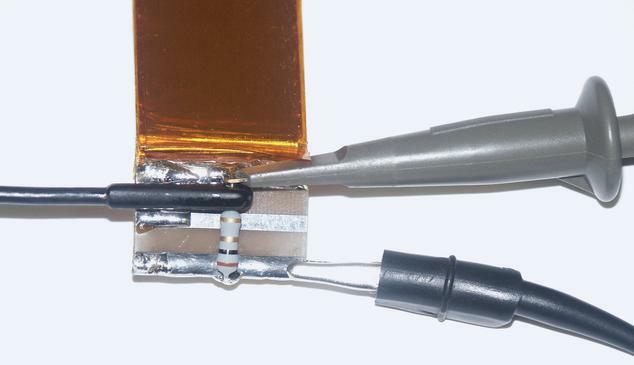 A short length of the resistor lead has been fed through the donut-shaped probe. The other end of the probe is connected to an oscilloscope. The waveform observed on the oscilloscope is proportional to the current measured by the probe. Avtech recommends two types of resistors for use in medium-current pulsed applications. The RCD RSF1A and RSF2B series of low-inductance 1W and 2W resistors are well-suited for low-to-medium current applications. They are available with resistances as low as 0.1 Ohms. The RSF1A is relatively small, physically. See http://www.rcd-comp.com/ for more information. The Ohmite OX and OY series of low-inductance 1W and 2W resistors are well-suited for medium-to-high current applications. They are extremely rugged, and are less prone to fail when abused, compared to the RSF1A and RSF2B series. However, they are larger in size. See http://www.ohmite.com/ for more information. These resistors are readily available from Digi-Key (http://www.digikey.com/). It is generally advisable to connect several resistors in parallel to achieve a low resistance, because this has the added benefit of also lowering the total effective inductance.